Edinson Volquez tried a new plan in ALCS Game 1 against the Toronto Blue Jays, and it worked so well that the Kansas City Royals jumped out to the early lead in the series. KANSAS CITY—Postseason games give us indelible moments that we use as proxy for what happened over nine innings of baseball. Jose Bautista flips his bat upon homering. Daniel Murphy steals an unguarded base. Every so often, however, what most decides a game happens out of camera range—and it happens even before the game begins. What makes the outcome possible can be found in the planning. Game 1 of the American League Championship Series Friday fell into the file of such unusual games. The turning point occurred when Royals pitching coach Dave Eiland sat down with his starting pitcher, Edinson Volquez, and his catcher, Salvador Perez, before Game 1. Volquez, like just about every pitcher, found the Toronto Blue Jays lineup to be a minefield of trouble. He had started six times against Toronto in his career and emerged battered almost every time: 0-4 with a 6.46 ERA. Volquez has made $23 million in his career because he can stretch the strike zone horizontally, especially around the area knee-high or below: two-seam fastballs in to righthanders and changeups and curveballs away. The Blue Jays knew this. They also knew that with so much pregame chatter about the Aug. 2 start by Volquez against Toronto that degenerated into a beanball battle, they weren’t worried about him coming too far inside. What Eiland didn’t tell Volquez is that deep down he was a bit worried. Volquez was Kansas City's man with a plan. It was a winning one. Eiland’s idea for the Jays to see a different Volquez worked as well as he could imagine. Volquez gave the Royals six strong innings as they became only the fourth team all year, and the first in three months, to allow Toronto no runs and no extra-base hits in what became a 5-0 win. What made the plan work even more effectively was a surprise not even Eiland counted on: Volquez threw his sinker harder than he had in more than three years. According to Pitch F/X, Volquez averaged 95.55 mph on his two-seamer, his best velocity in 113 starts since July 30, 2012. And the Blue Jays had never seen this kind of pitching from Volquez, either. 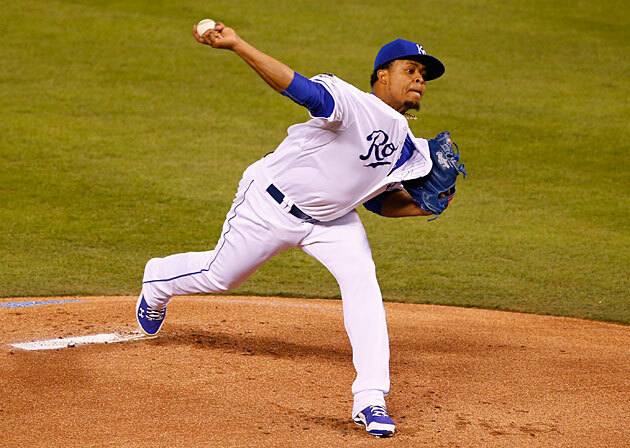 Volquez took a rare, ill-advised detour from the winning plan in the sixth inning. Facing the heart of the Toronto lineup for a third time, he suddenly tried to trick the Blue Jays hitters with changeups and curveballs. All he got from such trickery were walks to Josh Donaldson and Jose Bautista that brought the tying run to the plate—and a visit from Eiland. It was obvious what was happening: the pitching coach needed to get in his grill to tell him to go back to throwing that hard, elevated sinker. “That’s exactly what I told him,” Eiland said. Volquez immediately went back to his power sinker, and with it immediately restored order. He blowtorched two elevated sinkers at Edwin Encarnacion, a great fastball hitter otherwise, but not against these two heaters. Encarnacion was late on them and managed only two foul balls. Volquez bounced a diversionary changeup, then went back to the fastball, throwing it past Encarnacion for strike three. The rest of the inning would go likewise: Chris Colabello flied out on a hard sinker and Troy Tulowitzki struck out on a hard sinker. Volquez’s night against Toronto left him with nothing to complain about. He became only the seventh pitcher this year to shut out the Blue Jays for at least six innings while giving them no extra-base hits. The others were the Royals' Danny Duffy, the White Sox' Jeff Samardzija, the Rangers' Yovani Gallardo, the Nationals' Jordan Zimmermann, the Rays' Chris Archer and the Orioles' Ubaldo Jimenez. This series, unlike the National League Championship Series, wasn’t supposed to be about starting pitching, especially Game 1, in which two 32-year-old pitchers who were born two days apart, who both feature changeups and who both have been released in the past five years figured to be incidental to a bullpen battle. But Volquez, and to a lesser degree Marco Estrada of Toronto, turned the game more into a battle of starting pitchers than could have been expected. The effort by Volquez put even more pressure on a man who already carries a heavy burden into his Game 2 start: David Price of the Blue Jays. The free-agent-to-be is going to hit the jackpot because he has been one of the best and most durable lefthanded starting pitchers in baseball. But what matters most now is Price’s ability to win a postseason start and to pitch like the ace in which his team invested when it acquired him at the July trade deadline. Price is the only pitcher ever to make six postseason starts and lose them all. He pitched middle relief in a blowout win in Game 4 of the ALDS, a low-leverage usage that conveniently allowed manager John Gibbons to start Marcus Stroman in Game 5 without having to answer questions about why not start Price. In his two postseason games Price has suffered from worse fastball command than usual, possibly the result of taking 11 days of rest before his ALDS Game 1 start. This is not a must win for Price, but it’s fairly close. MLB teams that fell behind 2-games-to-0 in a best-of-seven series have lost the series 83% of the time (13-63). The good news for Toronto is that Price, who is now 230 1/3 innings deep into the season, actually saw an uptick in velocity when he worked out of the 'pen in Game 4. Now all he needs is a plan.